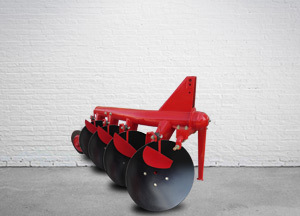 Disc Plough used for deep ploughing in root-infested, sticky, stony, and hard soils. Mixes remains of crops and weeds throughout the depth of ploughing , hence it is ideal for rain-fed areas for checking soil erosion by water and wind. Spring loaded floating rear furrow wheel control the side draft to ensure straight work and ease of handling by smaller tractor. Re-greasable Taper Roller Bearing in disc hubs. Cat I and II linkage. Disc Scrapers are also adjustable to ensure that the Discs remain clean in all conditions.